machine is protected from dust and blows and is optimally stored. 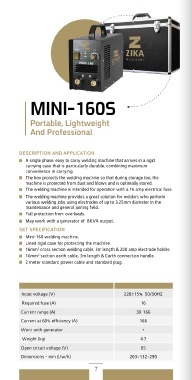 The welding machine is intended for operation with a 16 amp electrical fuse. maintenance and general joining field. May work with a generator of 8KVA output. Lined rigid case for protecting the machine. 16mm2 cross section welding cable, 3m length & 200 amp electrode holder. 16mm2 section earth cable, 3m length & Earth connection handle. 2 meter standard power cable and standard plug.